Have you ever complained about paying big cable bills for dozens of television channels you never watch? And how many times have you turned on your television only to discover that the cable is out? You then call the cable company and get an automated recording that says your connection should be back online sometime later in the day, after your once-in-a-lifetime program is over. 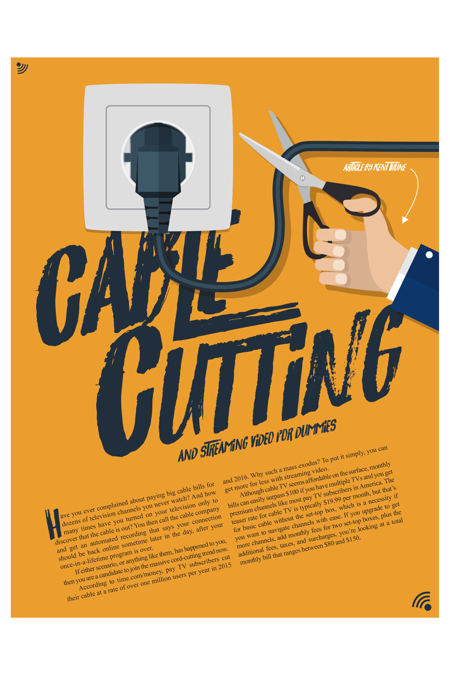 If either scenario, or anything like them, has happened to you, then you are a candidate to join the massive cord-cutting trend now. According to time.com/money, pay TV subscribers cut their cable at a rate of over one million users per year in 2015 and 2016. Why such a mass exodus? To put it simply, you can get more for less with streaming video. Although cable TV seems affordable on the surface, monthly bills can easily surpass $100 if you have multiple TVs and you get premium channels like most pay TV subscribers in America. The teaser rate for cable TV is typically $19.99 per month, but that’s for basic cable without the set-top box, which is a necessity if you want to navigate channels with ease. If you upgrade to get more channels, add monthly fees for two set-top boxes, plus the additional fees, taxes, and surcharges, you’re looking at a total monthly bill that ranges between $80 and $150. But streaming video offers more choice, greater customization, no sudden outages while watching your favorite show, and no customer service problems, all for a fraction of the cost. So, it’s no surprise that streaming video is changing the landscape of television and everything about how we receive information and entertainment in our homes today. If you’re new to streaming, here’s a basic summary: You’re probably familiar with downloading, as it pertains to video, from a website on the Internet. Streaming is similar (but better). When you download, you select (or click on) the video file you want, wait for the download to complete, then you watch the video. But when you stream a video, you start watching it almost instantly as it downloads slightly ahead of your viewing pace. So, to get streaming video on your TV, all you need is an Internet connection and a device to receive the Wi-Fi signal in your home. That’s assuming you have an HDTV, which would be almost any television manufactured in the past 10 years. The most popular streaming video devices are Roku, Apple TV, and Amazon’s Fire TV Stick. These devices will connect via HDMI cable to a TV’s HDMI port and will enable any TV to stream digital content over Wi-Fi such as Netflix, YouTube, Pandora, Hulu, Amazon Prime, HBO, and countless other channels. The functionality and display of the streaming device on a television is similar to apps on a smartphone. On the homepage display, you’ll see all your streaming video channels as icons on the TV screen. Using a small, handheld remote, you can easily select your desired channel, then select the program you want to watch on that channel’s listings. This brings up the convenience aspect of streaming video on TV: You watch your selected program whenever you want to watch it. If you can’t watch the entire program, you can simply pause it and watch the remaining portion later. There are also options to watch live programs through streaming video. However, most of the major networks don’t stream live broadcasts unless you buy a premium app. But if you miss a live broadcast, such as the evening news, you can later go to the network’s free streaming channel and select and watch any segment of the broadcast that interests you, while ignoring the others. That’s custom content at your leisure! So now you know that there is an attractive alternative to cable TV, but how much does streaming video cost, and how do you install it in your home? Most streaming video devices like Roku and Apple TV are priced under $100. But this is a one-time purchase, and there are no monthly fees to operate the device. Dozens of free streaming channels are available on these devices, but many users also subscribe to one or two premium channels, such as Netflix or Amazon Prime, both of which offer a wide variety of movies and original content. Fortunately, most premium channels offer 30-day free trials. So, you can always cancel if you don’t like the content. Before you cut the cord, there’s just one more piece to complete the puzzle: Assuming you still want over-the-air (also known as OTA or free TV) networks, such as ABC, NBC, CBS, PBS, and FOX, you’ll need an antenna to view their live broadcasts as you did via cable connection. This turns out to be another compelling reason to cut cable and go streaming, because OTA reception can be higher quality than cable. This is because cable companies have to compress the signal to reach thousands or millions of customers over long distances. With your own antenna, no compression is necessary, thus you get the best possible image quality. For many residents in the Lowcountry, especially those who live in a community with strict rules prohibiting visible antennas mounted on rooftops, attic antennas are best for OTA TV. Most of the major networks broadcast from Savannah, which is about 30 miles away from Hilton Head Island and up 70 miles away from outlying areas in the Beaufort county area. So, you’ll need an antenna that can reach that distance. An outstanding antenna that has up to a 70-mile reach is the Multidirectional Outdoor HDTV, which is manufactured by Antennas Direct and is available at Best Buy for $150. If you want to splurge a bit more, it can be a good idea to get a pre-amp to boost the signal. If you’re mounting the antenna yourself, check out the website, tvfool.com, which can tell you exactly how far away each major network is from your home and the precise direction to point your antenna to get the best reception. If you already have multiple TVs connected to cable in your home, it is possible that you will be able to use that same cable line to connect to your antenna. Now for the best part of the story: The total cost to buy the streaming device, the quality antenna, the pre-amp, and HDMI cable is approximately $300. At this price, the investment will pay for itself in about three months! Throw in a few premium streaming channels like Netflix and Hulu-Plus for $10 each per month, and you’re still saving between $50 and $100 on your monthly bills compared to cable—up to $1,000 per year! Kent Thune enjoys being cable-free in the Lowcountry with his family on Hilton Head Island. He also owns a money management firm, Atlantic Capital Investments, LLC, and is a freelance writer. You can follow his musings on mind, money and mastery of life at TheFinancialPhilosopher.com or on Twitter @ThinkersQuill.